Monsignor George R. Demuth, 97, was honored at a Mass to celebrate the 70th anniversary of his ordination to the priesthood at 10:30 a.m. Sunday, March 13, in the chapel of the Little Sisters of the Poor’s Holy Family Residence, 2500 Adams Ave., Scranton. The Most Rev. Joseph C. Bambera, bishop of the Diocese of Scranton, was the main celebrant, and Monsignor Demuth concelebrated the Mass with him. Demuth, who was born in Scranton on March 16, 1919, entered the Pontifical College Josephinum, Columbus, Ohio, when he was just 14 years old. Following 13 years of studies in theology, philosophy, Latin, Hebrew, Greek, German, and Spanish, Demuth graduated from the seminary and was ordained on March 10, 1946. He celebrated his first solemn Mass at his home parish, St. Mary’s of the Assumption Church, Scranton. Following assignments at parishes in Williamsport and Wilkes-Barre, Demuth was assigned to St. Mary’s of the Assumption Church in 1970 where he served as pastor for more than 25 years until his retirement. 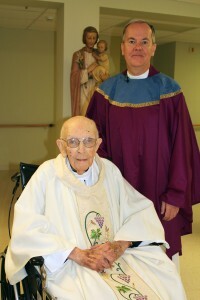 Upon his retirement he was named Pastor Emeritus of the parish. Monsignor George R. Demuth, pastor emeritus of the former St. Mary’s of the Assumption Church, Scranton, is pictured with The Most Rev. Joseph C. Bambera, bishop of the Diocese of Scranton, following a Mass in celebration of Monsignor Demuth’s 70th anniversary of his ordination to the priesthood.